Exterior decks made of hardwoods such as Ipe, Meranti, Mahogany, Massaranduba, Cumaru, Tigerwood, and other exotic woods add beauty and value to your home. Although these woods are extremely durable, they do require regular maintenance to keep them looking their best. Messmer’s Wood & Deck Cleaner (Part A) – omit if the deck is already cleaned. Messmer’s Wood & Deck Brightener (Part B) – use after cleaning with Part A. Do not begin the process until you have read and understand all instructions. If you are in doubt, call us toll free at 1-800-731-3669, weekdays 8-5 Mountain time. Do not apply if rain is expected within 48 hours. In certain climates you may have to wait for a different time of year to do this. We recommend doing a test area on your project to insure your satisfaction with color choice before proceeding with the entire job. Sweep excess debris (dirt and leaves) off the deck. Clean the deck with Messmer’s Wood & Deck Cleaner (Part A), or another high quality wood cleaner of your choice, then rinse thoroughly with clean water. Immediately after cleaning and rinsing, use Messmer’s Wood & Deck Brightener (Part B) to brighten the wood and neutralize the pH. Make sure the deck surface is clean, dry and in good condition. You may need to wait a few days for the wood to completely dry depending on weather conditions. Cover plants, grass, concrete, trim, and any other areas you don’t want stained. Stir or shake the product thoroughly. 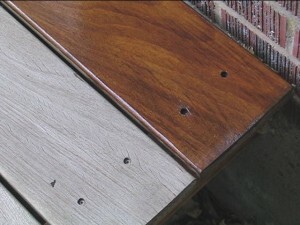 Make sure that all pigment is mixed evenly into the stain. 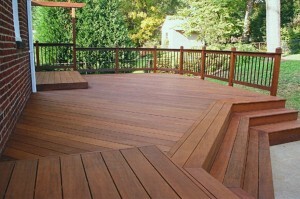 Apply one coat of UV Plus for Hardwood Decks following label directions. Work with the grain. After 30 minutes, brush or roll out any excess product puddled or pooled on the surface of the deck. If excess product is not removed, sticky, shiny spots will remain on the surface. A: Typically UV Plus for Hardwoods needs to be reapplied every one to two years. Hardwoods are exceptionally dense and do not allow much product to penetrate the wood, so they often require more frequent maintenance than softer woods like redwood and cedar. The length of time will vary depending on the wood used, the way the deck is constructed, which direction it faces, and your local climate and sun intensity. A: Be sure to wipe up any excess product about 30 minutes after application. UV Plus for Hardwoods is a high solids product, and if overapplied it will not just evaporate away. It is designed to be a penetrating finish and does not dry quickly if overapplied to the surface. All exterior surfaces collect dirt, dust and contaminants. It is necessary to clean them periodically to keep them looking good. We suggest using Messmer’s Wood & Deck Cleaner (Part A) at least twice a year for periodic maintenance cleaning.